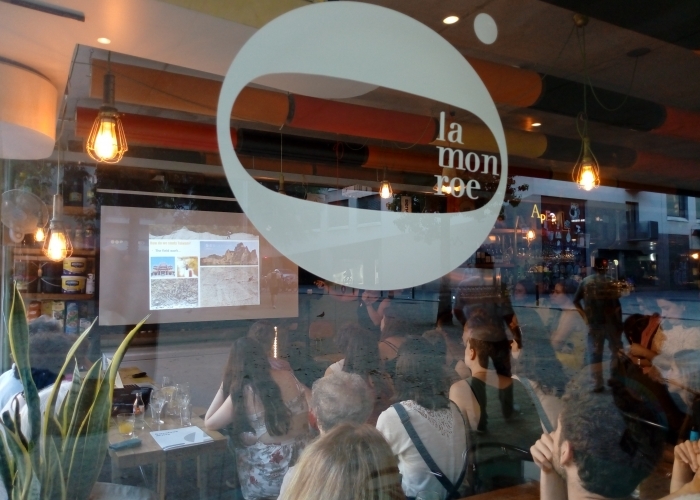 On July 17, 2018, the fourth edition of "Científiques a prop" (Getting closer to scientists) organized by AMIT-CAT took place with great success in La Monroe de la Filmo. 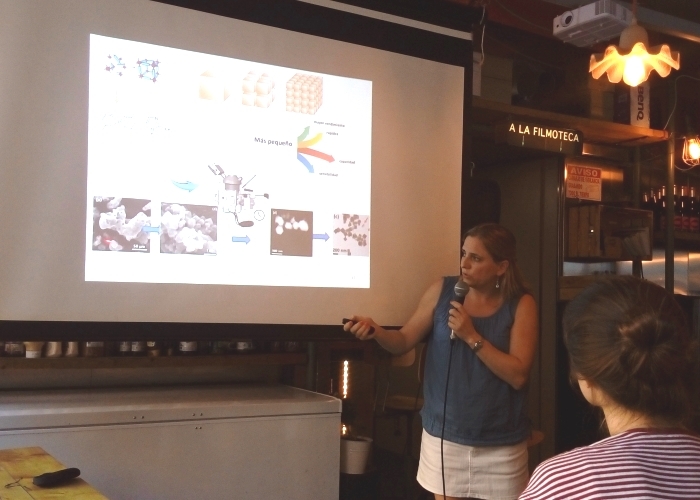 This edition counted with the participation of Ana M. López-Periago, from the ICMAB, who became second in the audience award, with her talk on "CO2: hero or villain? ", in which she talked about the benefits of using supercritical CO2 in the preparation of materials. 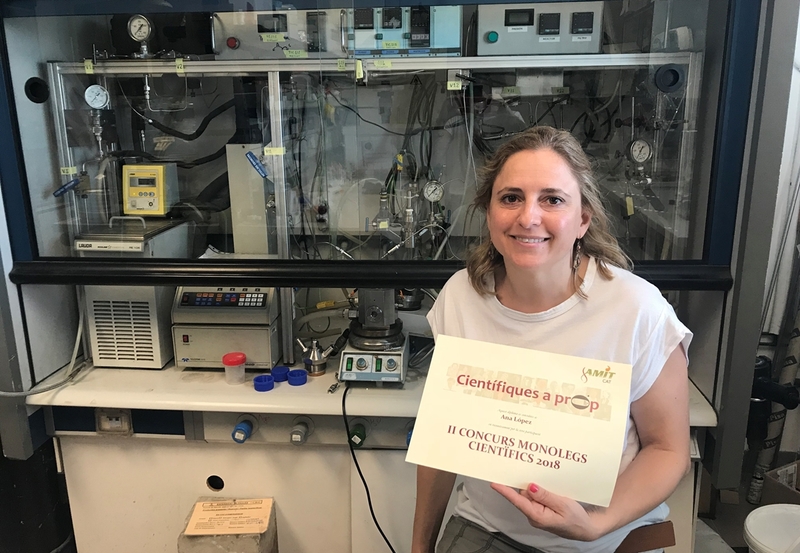 Ana M. López-Periago is a Ramón y Cajal researcher at the ICMAB. She focuses her research on the development of new nanostructured materials using clean technology: supercritical CO2 (scCO2). The new nanostructured materials can be applied in drug delivery, biomaterials and cosmetics. Although she also explores aspects of commodity materials processing using this technology: materials for CO2 capture, porous transparent supports for photocatalysis, etc. Congratulations, Ana, for this nice award! The event counted with the attendees of the summer school "Diversity in the Cultures of Phyiscs". This school is developed in the context of the Erasmus+ strategic partnership between the Freie Universität Berlin, the Universitat Autònoma de Barcelona, ​​the Universitat de Barcelona, ​​the Uppsala Universitet, the University of Manchester and the University of Sheffield. It is a bilateral exchange program for young physicsts women with the aim of facilitating the transition from the degree to the master's or doctorate studies and opening transnational perspectives for a career in physics. This course, 2017-2018, the school is aimed at young physicists from the University of Barcelona, ​​the Universitat Autònoma de Barcelona and the University of Uppsala. It takes place in Barcelona (from July 16 to 29, 2018) and in Uppsala (from August 13 to 26, 2018).